"What on earth am I going to whip up for dinner with this?" Been there?? *sigh* You just have to laugh! That was me tonight. There were no spuds, no pasta, a piddly amount of rice and that's it as far as 'most commonly used' ingredients goes! There was one packet of rice paper wraps. Hmmm. I looked in my freezer. 10 sausages and 1 tray of 500g free range chicken tenderloins, 4 sheets of puff pastry. I had 2 carrots and 1 zucchini left in the fridge, along with 4 little bits of bacon. I had heaps of onions and garlic though! I had the idea of using my food processor to 'wooj' (that's French for 'wooj'!) 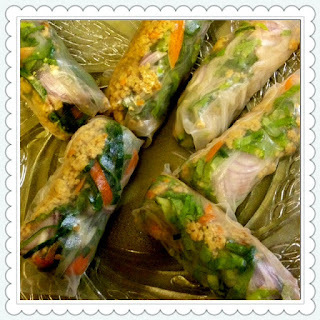 up all the ingredients and make it in to sausage rolls and rice paper wraps. They were delicious!! The kids loved and devoured them and asked if we could have it again! Happy Mummy! So what's the point in my sharing this? We are 'tight' financially for the time being for a few valid reasons, but I was able to cook a great dinner that filled my family, was delicious, nutritious (apart from the 4 puff pastry sheets! ), minimised wastage and made the little food we did have go a long way. I want to encourage you, if you are in financial stress, to not give up. To try and be creative, think outside the square and just do your best. I don't know the extent of the stress you may be in, but I know that we serve a God that never lets us go hungry, who provides our every need (and sometimes our wants too, because He just wants to love us like that! ), who inspires us to create these kinds of meals so that our families are fed. He is amazing! I've written out the recipes for you so that you can make them for your family too if you would like. My children have no problem eating 'whole' pieces of vegetables, but I know that some children don't enjoy that, so the processing of the ingredients 'hides' them! I basically added all this (Except the puff pastry sheets) raw to the food processor, pressed the button and added water if needed! The end result was a 'paste' that looked like something that was less than appetising! You can just stop processing when you've got your desired texture. I fried it off in the last dribbles of my olive oil (it resembles mince, but just with more flavour!) 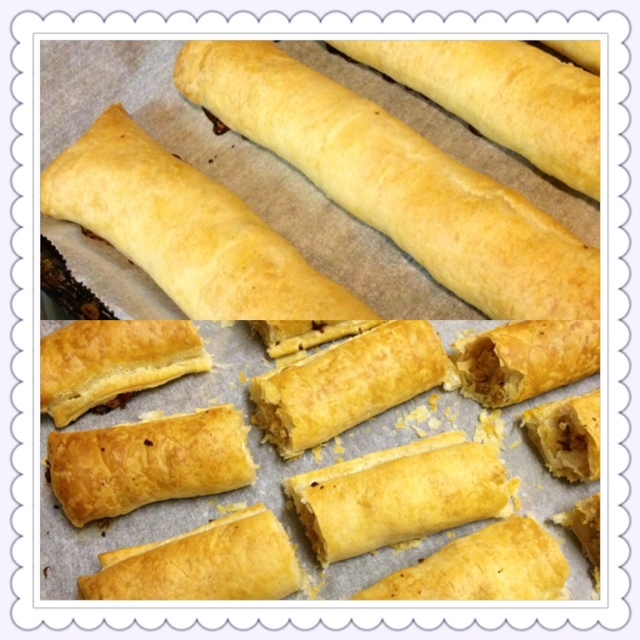 and then rolled it up in half cut sheets of the p/pastry, put it in the pre-heated oven at 200'C until golden brown. You could add or change the ingredients as suits your families diet/tastes ... I had no choice but to use what was on hand tonight! Why is it that photos of these little bundles never look attractive?! Prepare wraps as per packet instructions, then add fillings, wrap up and enjoy! (They are fabulous dipped in soy sauce). Once again, you can choose to add/delete anything you want, this is just what I had. The best part? There were left-overs! God is amazing! When we are diligent in using what we've got to the best we can, He takes care of the rest! I thought of making the meat up in a bulk batch one day and freezing it in it's 'raw state' in portions, so it could be made into things like pies (with a bit of a gravy needed I think), rissoles (probably add an egg or two), even just lightly fried and on toast for a quick meal, lightly fried and served in lettuce cups (topped with maybe fresh thinly sliced chilli and shallots with a dash of soy sauce/sweet chilli as an appetiser), pizza topping, through fried rice?, mixed through a pasta with a creamy herby kind of sauce?, spring rolls, lasagne, spaghetti, cottage/shepherds pie ... you get the idea, it's pretty versatile and best of all is that we know what's in it! For those of you who dress your own 'home-grown' chickens (as my husband does when needed), we thought that as you can sometimes get a 'little on the lean side' bird, it would be great to remove the meat and use it in meals like this to stretch it further (skin off of course). God is just so good! Let me know if your kids loved this too. What are other 'variations' you can think of? I wonder what will become of the 10 sausages tomorrow night? I'm linking up with Naomi over at 'A Wise Woman Builds Her Home' ... you are most welcome to join us!